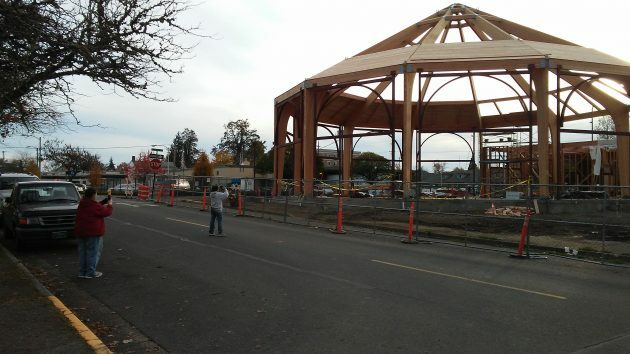 Onlookers snap photos of the skeleton of the Albany Carousel building on Thursday evening. 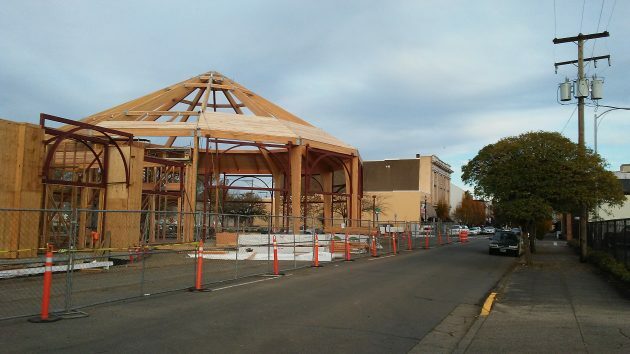 A couple of things strike me about the new Albany Carousel building rising on the northwest corner of First Avenue and Washington Street. One is the degree to which the place has already become an attraction for people wielding their mobile phones as cameras. Most of the times I pass the construction site, there are spectators holding up their phones to capture a shot of the building as it grows.. The other thing is the surprising — to me — height of the building. The peak formed by those laminated roof beams rises roughly to the height of a three-story building. You can check it yourself by drawing imaginary perspective lines from the three-and-a-half-story Masonic Temple across Washington Street. And if you count the flagpole on top to be added later, as the design calls for, it will be taller still. The Masonic Temple in the background on First Avenue West. A carousel! The perfect Albany metaphor. Yes, this merry-go-round is loaded with unintended symbolism and metaphor. But, hey, CARA is involved. Invincible ignorance dominates the thinking. We have yet to see how this long awaited attraction is going to provide parking? As you may know many of our senior center users are concerned about lack of parking, as that is already in short supply some days in the very active and busy Senior Center. Your article is inspiring in one regard, and disappointing in another. Projects that weave the spirit of private voluntary association and volunteerism are inspirational. It is always good to see private people freely spending their time and money in a spirit of human kindness. But these threads become frayed when private projects start feeling entitled to public money. CARA, through its borrowing and spending scheme, has now committed $750,000 of property taxes to help fund this ‘private’ project. The $750K was diverted from essential services like public safety, education, parks, and library. Is the carousel a higher priority than these essential services? There now exists a stain on the project’s foundational spirit of free association and volunteerism. And if the carousel can’t sustain its operations, will the city fork over more taxpayer money to bail it out? How much more will the carousel take from the budgets of local taxing districts? The carousel organization needs to focus on being an asset, not a burden, on local taxpayers. They are off to a poor start. Looking great. Already obvious that it is going to be wonderful for the downtown area.